Climbers Against Cancer (CAC) is a charity that is very close to us here at The Climbing Works and we are always thinking of different ways to try and raise further funds for this great cause. Historically we've had big fundraising pushes at The CWIF as well as always having CAC buckets for loose change at reception as well as selling the very popular CAC T-Shirts in our shop (with 100% of the cost going to CAC). This November we're hijacking / complementing / supporting the Movember cause as a way of raising funds for CAC. If you've not heard of Movember, a quick summary is that Men grow (generally very bad ) moustaches as a way of raising funds and awareness towards Mens health, in particular prostate and testicular cancer. The idea started off with 2 guys having a beer in Australia in 2003 and has grown into a worldwide phenomenon which raises countless millions for research, but more importantly, increases public awareness and education while reducing the stigma of Men talking about their health issues. The history and ideas of the Movember foundation cross over and shares a lot with the vision and history of Climbers Against Cancer. Founded by John Ellison, CAC firmly gives two fingers to Cancer and has grown from a tiny idea to a worldwide cause supported widely by the international climbing community. You can read all about it's history, the donations it has given to research and the effect it has on the climbing scene on the CAC website. So this November we, The Climbing Works staff and cheeses will be partaking in a bit of hair growth to raise funds for CAC. From the 1st November, you will see the buckets as normal at the reception desk and there will be a limited edition t-shirt for sale also (see below). We just ask that you support the bad facial hair by throwing your change (and notes) into the buckets. You can also donate online on the CAC website. If you are a climber here and want to grow a Mo to support the cause and raise funds from friends then please do. In exchange we are happy to give those growing Mo's half-price hot drinks throughout the month of November. There are some rules to follow if you are growing a Mo and these can be found on the Movember foundation website here. If you are a Female and are feeling left out, don't worry, you can participate too. The Movember website has some great ideas on becoming a Mo Sista and your support is very much appreciated and incredibly important. If you are a Mo widower (your significant other is taking part) we are very happy to also over you half-price hot drinks throughout the month of November. Just point at his Mo when ordering drinks at the cafe counter. We would like to spread this beyond The Climbing Works and would love other climbing walls to come on board and have their staff & customers take part. If you are a regular at another wall, maybe give them a nudge or send them the link to this blog. The more Mo's, the more money for CAC. Thanks for being part of The Climbing Works and supporting CAC. "National Performance Centre's (NPCs) will be flagship facilities in British climbing and operators will work closely with the BMC and the GB Climbing Team to run the facility not only as a successful climbing centre but also as a high standard competition climbing venue. NPCs will also have an important role in providing training facilities for GB Team members and top-end climbers." 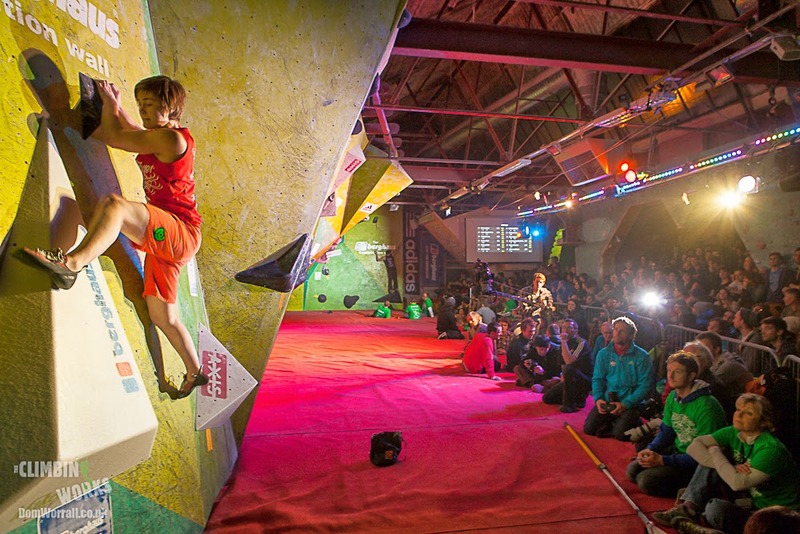 - The Climbing Works International Festival (CWIF) is the biggest annual international climbing competition taking place in the U.K. and attracts a large crowd who watch the Semi's & Final on the Berghaus Competition wall. - The Berghaus Competition wall allows Senior, Junior and upcoming stars to train on a Competition wall (and problems) that could be found on the IFSC World Cup circuit. How will this good news effect our regular climbing members and The Climbing Works in general? Well not that much really. We will continue as normal to provide high quality problems for climbers of all ages and of all levels. We believe in setting quality problems for those starting climbing on Font 3+ right up to those climbing Font 8b+. We will continue to set regularly and look to improve our centre whenever we can. Indeed, in the coming month we will have some more improvements to our training area near the Campus boards which should benefit all our members. The title of a National Performance Centre is one we are very welcome to receive as like any title it not only reflects the future but the past. We - cheeses, staff, coaches, friends - have all worked hard over the years to create a bouldering centre that you - our customers, partners, sponsors - can be proud of and happy to be associated with. The title is indeed a very nice 'pat on the back' and is gratefully received by all of us here. We will use it to help promote our sport to a wider audience and further encourage us to keep pushing what & how we do it. Right back in the day!! Jacky Godoffe sets something thin during the very first set of problems ever put up in The Climbing Works in November 2006. Thanks to all who have contributed to The Climbing Works over the years. We look forward to living up to this title for many years. N.B.For those climbing in Sheffield you are indeed lucky with two National Performance Centre's and a historically important and World famous lead wall - The Foundry - and an elite training facility - The Moon School room. Not to mention the unique and superb Peak District on our doorstep. N.B.#2 You can help celebrate this, and another year, with us at our annual birthday party on Friday 12th December 2014. It will, of course, be another big one : ) Details to follow in November but the venue is very close to last years in Sheffield city centre.